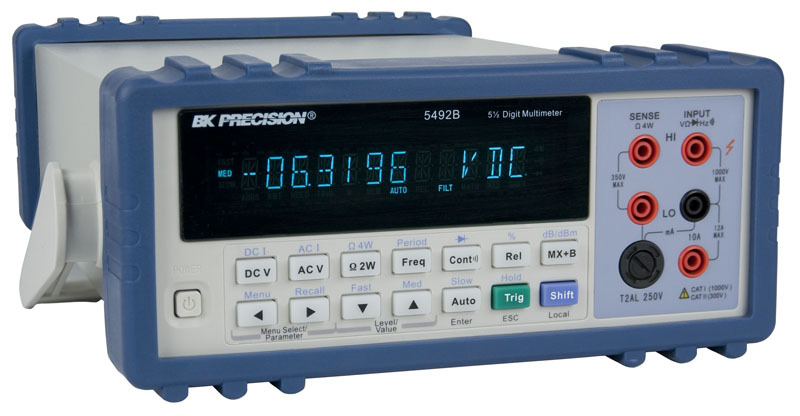 The B&K Precision model 5492B is a versatile 5½-digit, 120,000-count bench multimeter suitable for applications in education, service repair, and manufacturing. The instrument enhances your productivity with built-in math functions and USB connectivity. Rel, Max/Min, dBm, dB, %, and Hold functions provide educators with a convenient tool to teach basic math concepts. Additionally, the 5492B offers powerful features not commonly found in other 5½- digit DMMs such as advanced triggering, buffer storage operation, and a GPIB interface option. 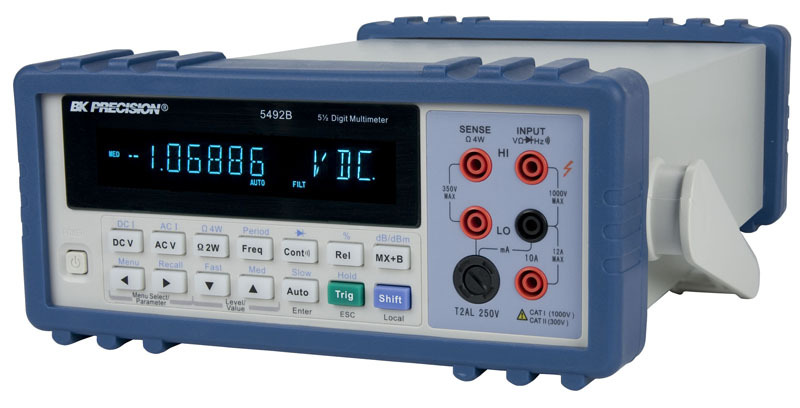 The 5492B measures volts and amps with great accuracy and stability, with basic VDC accuracy of 0.01%. The meter is also capable of measuring frequency, period, resistance, continuity, and performing diode tests. Readings can be taken at a maximum rate of 57 readings/sec and stored to an internal 512-byte buffer for post acquisition statistical analysis. The 5492B was designed for cost-conscious users requiring an accurate meter with a broad range of features offered at a value price. 19 Inch rack mount kit for one or two half rack B&K Precision meters and instruemnts. Includes only front end hardware. This kit of accessories was assembled to facilitate requirements by high-performance bench digital multimeters (DMM's) users. All the most popular accessories in one kit. The kit offers MiniProbe test probe, with spring-loaded tips, for fine probing; MiniPRO Test Clips for small and MiniFlex Test Clips for micro connections; and for those larger test points, both spade lug and banana plug adapters, two pairs of test leads for 4-wire measurements or calibration hookups, an insulated BNC male to sheathed banana jack adapter, and an insulated SMD Tweezer set for surface-mount component testing.